Men's Jeans that are tough enough for the job at hand. And now, youth and boy's work jeans too. How tough is "man" tough? Almost as tough as "kid" tough. Key Brands tough. But tough without comfort won't let you get your job done. These work pants have pockets where you need them, and are relaxed enough to let you move in comfort. Choose your Western work jeans in unwashed, firm finishes, ready to starch, or in garment washed denims, that can be taken right out of the dryer, and worn. 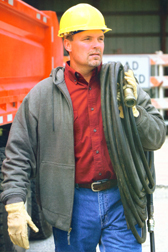 100% Cotton Duck work pants have the details you need to make your work day go by fast. Whether you need the double re-enforced knees, or a place to carry your cell phone & tape measure, you can choose the right men's work pants for the stuff you need done. Key understands that comfort and function must work along side of good looks. So, rather than here's one style, take it or leave it, They offer a variety for you. (Sometimes, too many to show.) If you have a favorite, that is not shown here, just get us the style number and Cultured Cowboy will be happy to order them for you. Key, and their co-brands of Lakin McKey, Polar King, Wolf Mountain, and Tuff Nut, are worldwide, and priced affordably for the real world of welders, farmers, and construction workers. Sizes include "anorexic" to "real-healthy". Take advantage of our "3 for" savings. You can afford the best, when you shop with Cultured Cowboy. Notes: Each Item has an Item number followed by a DOT (.) and a couple blanks (__). The blanks are for the color numbers, when there are color options. Sizes are pretty true. If you are working in your coat and kinda between sizes, guess big. You can use a fabric water repellant on all the denim and duck materials. Any "Scotchguard" type product will work. We offer a great product, M&F Water & Stain Protector. Only $4.99. Premium Cotton Duck Dungaree Style Pants - Brushed Hand, Washed Finish. Relaxed Fit. Click here for the 453.__ larger detail page with size chart. 100% cotton heavyweight duck. Antique Brass hardware. Double Knee with cleanout. Reinforced front & hip pockets for durability. Oversized reinforced hip pockets. Loop for cellphone / tape measure on each side. Hammer loop. Double utility pocket. Triple needle stitching. Contractor Grade Denim Dungaree - Enzyme washed - Relaxed Fit. Click here for the 403.45 larger detail page with size chart. 14.5 oz. 100% cotton Denim. Button Waistband. Zipper fly. Triple needle stitching. Rivets at stress points. Five pocket jeans. Reinforced bottom pockets. Double utility pocket. Chap style double front on legs with cleanouts. Hammer loop. Single tool pocket. Click here for the 401.45 larger detail page with size chart. 14.5 oz. 100% cotton Denim. Button Waistband. Zipper fly. Triple needle stitching. Rivets at stress points. Five pocket jeans. Reinforced bottom pockets. Double utility pocket. Hammer loop. Welted Cell phone pocket. Tape Measure holder. Contractor Grade 5 Pocket Denim Jean - Enzyme washed - Relaxed Fit. 14.5 oz. 100% cotton Denim. Button Waistband. Zipper fly. Button closure on left hip pocket. Triple needle stitching. Rivets at stress points. Five pocket jeans. Reinforced pockets. Pencil slot in right hip pocket. Screwdriver loops. Tape measure holder. Cotton Painter's Pants - Comfortable, Traditional Fit. Click here for the 402.43 larger detail page with size chart. 100% cotton natural material. Reinforced back pockets. Utility pocket. Comfortable front pockets. Triple needle stitching. Hammer loop for spare brush, rag, scraper, or even a hammer! Denim Utility Pants - Comfortable, Traditional Fit. Click here for the 402.__ larger detail page with size chart. 11 3/4 oz 100% cotton. Button Waistband. Rivets at stress points. 5 pockets. Utility pocket. Triple needle stitching. Hammer loop. This jean is comfortable, stylish, and built to last. And, is available in a firm starch finish too. Denim Dungaree, Ring Spun Denim - Relaxed fit, Enzyme Washed. Click here for the 452.45 larger detail page with size chart. 12 oz 100% cotton. Antique brass button waistband. Triple needle stitching. Antique brass rivets on front pockets. Reinforced stress points. 5 pocket styling. Hammer loop. Double utility pocket. Another great feeling work jean, in a great relaxed fit. Denim 5 Pocket Jean - Enzyme Washed Ring Spun Denim - Relaxed Fit. Click here for the 4875.45 larger detail page with size chart. 12 oz. 100% cotton Denim. Antique brass button waistband. Zipper fly. Cell phone pocket on right leg. Double needle stitching. Reinforced stress points. Five pocket styling. Reinforced front pockets. Tape Measure loop. New Promotional Prices: Limited Time! Denim 5 Pocket Jean - Enzyme Washed Denim - Traditional Fit. Click here for the 4874.__ larger detail page with size chart. Heavyweight Denim 5 Pocket Jean - Enzyme Washed - Traditional Fit. 13 3/4 oz. 100% cotton Denim. Antique brass button waistband. Felled outseam and safety stitched inseam. Zipper fly. Reinforced bartacked stress points. Five pocket styling. Black Logger Dungarees - Traditional Fit. Click here for the 444.01 larger detail page with size chart. 13 3/4 oz. 100% cotton. Zipper Fly. Button waistband. Triple Needle Stitching. Rivets on front pockets & watch pocket. Six suspender buttons. 5 pocket styling. Riveted hip pockets. Indigo Denim Logger Dungarees - Firm Hand, Relaxed Fit. Click here for the 446.41 larger detail page with size chart. Indigo Denim Logger Dungarees - Relaxed Fit. 14.5 oz. 100% cotton. Zipper Fly. Button waistband. Triple Needle Stitching. Rivets at stress points. Six suspender buttons. 5 pocket styling. Oversized mitered hip pockets with rivets. Single utility pocket on the right side. Indigo Denim Logger Dungarees - Chap front, Relaxed Fit. Click here for the 447.41 larger detail page with size chart. 14.5 oz. 100% cotton. Zipper Fly. Button waistband. Triple Needle Stitching. Rivets at stress points. Six suspender buttons. 5 pocket styling. Oversized mitered hip pockets with rivets. Chap style double front with rivets. Single tool pocket on the left side. Click here for the 48011.45 larger detail page with size chart. Indigo Denim Logger Dungarees - Chap front, Relaxed Fit. Enzyme Wash.
14.5 oz. 100% cotton. Zipper Fly. Button waistband. Triple Needle Stitching. Rivets at stress points. Six suspender buttons. 5 pocket styling. Oversized mitered hip pockets with rivets. Chap style double front with rivets. Hammer loop. Double utility pocket on right side. Single tool pocket on the left side. Looks similar to 4874.45 above. Enzyme Washed Indigo Denim Toddler 5 Pocket Jeans. Enzyme Washed Indigo Denim Toddler's 5 Pocket Jeans. 12 oz. 100% cotton Ring Spun Denim. Comfortable fit. Elastic back at waist. Zipper Fly. Button waistband. Tough Stitching. Rivets at stress points on jean pockets. 5 pocket styling. Antique pewter hardware. Premium, soft washed denim. 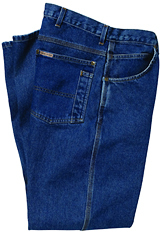 Enzyme Washed Indigo Denim Boy's 5 Pocket Jeans. 12 oz. 100% cotton Ring Spun Denim. Comfortable fit. Zipper Fly. Button waistband. Tough Stitching. Real pockets. Rivets at stress points on jean pockets. 5 pocket styling. Antique pewter hardware. Premium, soft washed denim. Sizes: 4, 5, 6, 7, in Slim, Regular or Husky fits. Enzyme Washed Indigo Denim - 5 Pocket Youth Jeans. Enzyme Washed Indigo Denim Youth 5 Pocket Jeans. Sizes: 8, 10, 12, 14, 16, in Slim, Regular or Husky fits. It is probably best to turn your clothing inside out, and fasten them, to wash them. Most washing machine makers are recommending this. Wash on a gentler cycle for a longer period of time using cold water for best results in keeping them looking as new as possible. If they are really muddy, squirt 'em off with a hose, then kind'a half hand wash them before you ruin a load of clothes with all that hair and mud. Once the bad stuff is off, then put those work clothes in the washer. Momma will really appreciate your efforts! Dry, but don't over-dry a lot. This keeps the fabric stronger. Take them out as soon as they finish and you may be able to skip wrinkling. You can lightly steam out the wrinkles with one of those laundry steamers, or iron (yuk?) as you see fit. Starch will keep your garments cleaner longer, and looking crisp. Starch kind'a fills the fibers so that stains have less ability to penetrate. I find that with heavy starch, I probably wash about 1/4 as much as without it. You can find this starch in any grocery store. I like the liquid, rather than the aerosol spray.